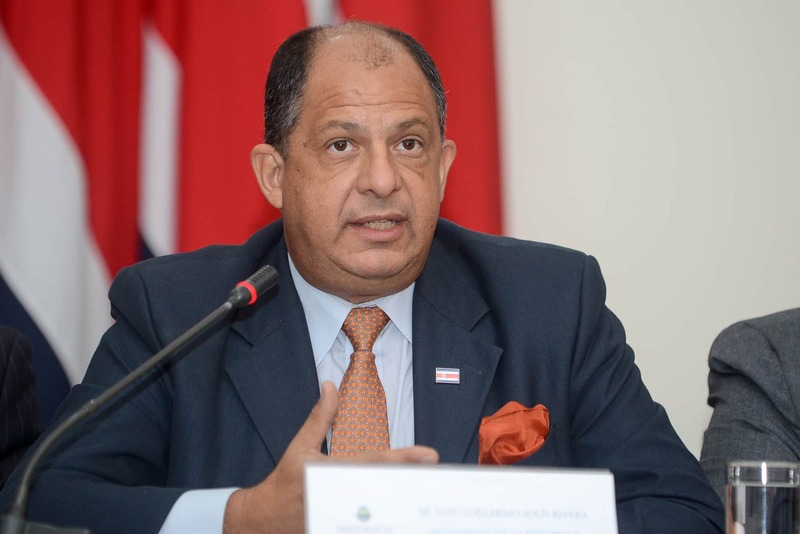 President Luis Guillermo Solís tried to walk a fine line between the economic and political implications of joining the Venezuelan-led Petrocaribe oil scheme, which some lawmakers have advocated as a solution to curb Costa Rica’s rising gasoline prices, during a press conference on Tuesday. The president, however, warned that cheap gas was not necessarily the best thing for the country in the absence of energy efficiency policies. Some critics of the Petrocaribe proposal have suggested that Costa Rica’s admission into the group would compromise its ability to conduct its foreign affairs independently of Venezuela, which sources the oil and founded the group in 2005. Solís argued Tuesday that it was possible to separate the economic and political implications of the Petrocaribe proposal. Casa Presidencial has said that there are no plans for Costa Rica to consider joining the Bolivarian Alliance for the Peoples of Our America, ALBA, an inter-governmental organization of nine countries founded by Cuba and former Venezuelan President Hugo Chávez. ALBA includes a number of leftist or socialist governments in the Americas, including Ecuador, Bolivia and Nicaragua, among them. Admission into the Petrocaribe scheme does not require admission into ALBA. Petrocaribe is a collection of 18 Latin American and Caribbean countries that buy oil and petroleum products from Venezuela with a mix of cash and credit payments over 25 years with interest. Earlier this month, lawmakers from the leftist Broad Front Party proposed admission into the oil-buying scheme as a way to lower Costa Rica’s fuel costs after Solís shot down a proposal in June from the Public Services Regulatory Authority to cut gasoline taxes, citing the country’s growing deficit. The Union of Private Sector Chambers and Associations (UCCAEP) released a statement Monday expressing their concern over the proposal, arguing that there were no guarantees that prices would decrease. “What Venezuela offers are not competitive prices but to pay later for the gas Costa Rica buys today. This would be irresponsible, to pay the bill in the future, which would only delay the problem,” UCCAEP President Ronald Jiménez said in a statement. Jiménez added that only structural change in the energy sector would address the spike in gasoline prices, reportedly the highest in Central America. Libertarian Movement Party lawmaker Otto Guevara has jumped on the gas price hikes to push a popular initiative to privatize the National Oil Refinery, RECOPE, a state monopoly. The party began collecting signatures to bring the initiative to the Legislative Assembly on July 14. Solís said the debate over fuel prices is urgent, but he stopped short of stressing gasoline prices as the ultimate goal of his government’s energy policy. “The country gains little by halving the price of gasoline if we don’t have the measures to economically use fuels, if we’re not to become a country that gulps petroleum like it were a glass of water, which would be a huge waste for the economy and [do] terrible damage to the environment,” Solís said. RECOPE has been tasked with preparing a technical and economic analysis of the proposal to join Petrocaribe, which Solís has said will inform the government’s decision. The president said that there is no deadline for the RECOPE report, but he hoped to see it as soon as possible.